In every town I’ve lived, there have been the regulars. In cities, there were the old men who daily smoked outside the front door of their apartment building. Or, the group of teenagers hanging about the corner for hours. Regular dog walkers. Early morning joggers. Solo folks saddled up to the bar having a bite to eat before heading home. All our lives connected through something bigger than any of us. Living rurally, we may not have the corner shop or the local bar, but we do have a cast of characters. The tall man with the curvy walking stick who leads visitors to places on the moors always stops to greet Millie and Brock. The local couple who are busy tracking and recording migratory birds to the area, dressed in camouflage and draped with more than a few pairs of binoculars routinely stop by to say hello. There are our regular egg buyers, dog walkers, bird watchers, or trail runners who are all part of our lives, even if we don’t always know their names. There is one, who remains a mystery to me. I’ve never met him. And up until recently I had never seen him. To catch a glimpse of him is akin to spotting the mythical Sasquatch or The Loch Ness monster. If there were Dartmoor Trading Cards, he may be perhaps the most valuable of them all. A vintage Babe Ruth. Michael Jordon’s 1986-1987 Rookie Card. The 1954 Ted Williams. Or, a mint condition Wayne Gretzky. It all began when we noticed a maroon and green van with a sky-blue top sheltered in various lay-bys on Dartmoor. We’d spot it any time of the day, but most often it was parked very early in the morning, or towards evening as the sun would begin to bruise the sky with a sunset. There are probably similar vans and campers moving about on Dartmoor, but this one is unique. In addition to its earth and sky colour theme, the side of the van shows a painting of a golden sun with radiant beams. In large letters across the top is written, “Vegan Hotdog”. I search the Internet and find little more than a story about a vegan hotdog receiving a 95% approval rating. There is also a moderately interesting story about a woman who ordered a vegan hotdog at a big international store, only to discover it had meat in it. Like any Internet search, there is a rabbit hole of articles. And yet I uncover no information, not even a photo, to shed light on my local mystery. This past year, Roger and I began reporting our various sightings of the van, sharing with one another where we saw it parked and looking abandoned. Occasionally one of us would see the van on the move. 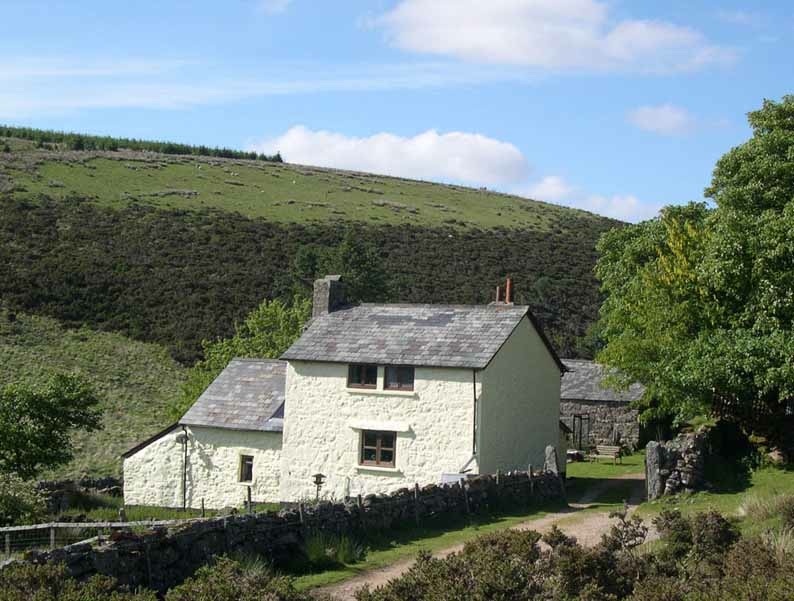 In the distance, just over the crest of a hill, the bright blue roof would appear. We slow our car in order to catch a glimpse of the driver, this Vegan Hotdog Man. He has a big white beard, but so does our friend Steve and I’m certain this is not a separate identity for him. The Vegan Hotdog Man seems to be driving alone in the van. I have never seen a dog or another person riding shotgun. Who is he? What’s his story? Since we don’t have Dartmoor Trading Cards, there are no stats to glean from this hard to come by collectable. With the new year upon us, I’ve turned my attention to making positive steps. I’ve upped my exercise, not as a new year’s resolution, but just to get it back to what it was before my Dad got ill last year. I’ve carved out more space for relaxing with a good book or listening – actually listening not just as background – to music. Brock and Millie are back into my school of obedience training, a casual but necessary school. And, as I do at every start of the year, I’m working on a clear out. Clothing that has holes. Paperwork which is no longer needed. Books long since read, which someone else might enjoy. And the growing pile of things to take to the local tip. With Roger’s help, we packed the car with recyclables and I drove to the tip. As I rounded the corner to find a strategic parking place for easy off-loading — metals in the metal bin, plastics in the plastic bin, glass in the glass bin — I spy the bright blue roof of the Vegan Hot Dog Van. Can it be? Is he here at the tip? Should I introduce myself? How do you start a conversation with a mystery? I’ve had this overwhelming sensation before. Being in an unusual place, spotting a celebrity – greater points awarded if they are a B-list celebrity – and not knowing my next move. Do I interrupt their privacy with a friendly “Hi? Don’t I know you?” I’ve done this: A still yet unknown Benedict Cumberbatch at the National Portrait Gallery; Laurie Anderson in the women’s restroom at the Brooklyn Academy of Music; and Colm Meaney at a hidden lake in Connemara, Ireland. Colm and I spoke about the beauty of the landscape and drank the water from the lake, but I chickened out at saying “I love you as Miles O’Brien on Star Trek: The Next Generation!” That felt too needy. As I walk past the Vegan Hotdog Man, I clutch my bags of recycling and slow my pace. He’s slender and tall, his white beard is thick and bushy. Beyond this, there’s nothing notable. Either that, or I’m a bad witness or easily distracted. Almost as soon as I see him, I turn my attention to the van, taking a casual passing glance inside the open door. But he’s doing what I’m doing and off-loading things at the tip. There’s no more information to be had about him than anyone else at the tip with our vehicles full of things to drop off in the appropriate bins. Perhaps one day, I’ll have an opportunity to introduce myself. Maybe we’ll meet at a party. Or, his van will be slightly blocking my car and I’ll need to politely ask him to move, sparking a casual series of questions. Or maybe, some ingenious person will produce a series of Dartmoor Trading Cards. The elusive Vegan Hotdog Man among the many collectables. Having just recycled several things, I don’t really want a collectable trading card, I just want to meet this man in the flesh. Snow descended upon most of the UK this past week. The last icy blast of winter? This season may feel like it will never end, but I know from experience the days will soon grow longer and beneath that blanket of snow, the snowdrops and daffodils will push up through the ground announcing the coming of spring. After two months of rain and mud, I welcome the freezing temperatures carried by The Beast from The East (the name given to the arctic temperatures which recently came from Siberia). Typically, English winters seem damp and temperate, but this unusually crisp, dry and cold atmosphere reminds me of winters in the States. So cold it felt like my eyeballs might freeze. The Beast surprised us on its first day: We awoke to find no water due to a frozen pipe. Armed with a hairdryer and determination, Roger made quick work to restore our water. After that, we began leaving a tap on to prevent another pipe freeze. We were somewhat loath to do this as the water pump working in the night might require the generator to start or drain our storage batteries. However, we could not afford to have frozen pipes and their attendant problems. Wisely, Roger started manually running our 30-year old Lister generator each evening to keep it from struggling to start in such cold conditions. This simple act kept the batteries topped up through the night. As we adjusted to hard ground, frozen sections of the river, and keeping everything ticking over, we found ourselves waiting for the arrival of Storm Emma. We felt certain it would be as if we were collateral damage during a match-up of Marvel Comic characters. And we were. Emma’s arrival brought fifty-mile an hour wind gusts hurtling down the valley from the north and a dumping of snow. Each walk with Millie felt like a polar expedition as we made our way through the growing drifts of snow. Living in a rural area, Roger and I naturally worry about our supplies of food and fuel and the welfare of the hens. Before Emma and The Beast coupled, we had wisely secured plenty of food, wine, firewood, books and went so far as to bring inside all the watering cans, and filling water bottles should we have another pipe freeze too big for our little hairdryer. Battened down and ready: Bring it on Winter! Looking out the window to the blizzard and all too aware that we could be snow-bound for a few days, my thoughts drift to childhood memories of sledding, building snowmen and snow caves and hoping school would be closed. The snow outside transforms the meaning of home inside, where we stoke the fire, listen more intensely to the radio, and remind one another of the various tasks to keep ourselves safe and Crockern operational. We may be considered remote, but in truth we are generally self-sufficient and could easily manage a week or two of isolation. But, not if we had an emergency! With equal measurements of sensibility and adventure, Millie and I started up the Land Rover and drove down the track. There were several large drifts across the track, but the snow was light and fluffy and I was in a four-wheel drive. I drove through these with glee! But at the end of our track, there was a drift about 4 feet high, blocking access through the gate. I grabbed my shovel, and began to dig. As this was Millie’s first snow, she realised she too could help rid the drift with her digging. In no time, the two of us cleared a path. We were lucky. Some of our neighbours were stuck as there were no passable roads to their houses. A friend’s generator wouldn’t start leaving him without electricity, which meant no heat or water. Many friends and neighbours had no water as pipes were frozen; while nearby, a neighbour had leaking in the house from a ruptured pipe. After the storm abated, most of the landscape was dressed in soft, virgin snow. It’s magical appearance a reminder of the power of nature. Across the country, traffic came to a standstill. Trains were cancelled or delayed by several hours. Plans to see friends aborted. When my schedule is disrupted by the weather, I only pretend frustration. Mostly, I sigh with relief: the world has stopped. When I look at our calendar and all the things I have had to cancel, suddenly many of them don’t seem so important. Winter slows our pace, disrupts the business of schedules and appointments and reminds us to re-organize priorities. It’s true, winter gets into our bones and at times can seem interminable, tedious and brutal. But as the snow transforms the previously muddy landscape, this cold reminds me of the visceral comfort of a warm fire, a glass of wine, rest and a good book. Hunkering down takes on greater joy! So too, I am reminded of that sense of excitement and boundless energy to get outside and enjoy the snow. Shovelling is not a chore, it’s playtime! Tossing snowballs into drifts for Millie to locate becomes the height of mischief for both of us. Shortly on the heels of the snow fall, arrived the freezing rain. Our track was clear of snow drifts, but it was beginning to become ice. The wind was gathering strength and generating a deafening sound, which all but muffled the moan of tree branches under the new weight of 3 centimetres of ice. Soon, all the snow will melt, and it of course will mean the return of mud. But this dreamy-blizzardy-back-drop, sandwiched between the rain and mud of winter, has helped restore a sense of what matters most. Sometimes, you just need a holiday. It’s not necessary that it be a great distance, an exotic location, or even an extended period. A few nights away, visiting friends is enough to help relax and restore. And that is just what we did. With our chickens secured for the weekend, Roger and I packed our overnight bags, Sam and Millie’s belongings, and a few gifts of flowers, wine and snacks into the car and headed out for a two-night stay with friends. Road Trip! Ian and Carol have a wonderful set up, living and working on twelve acres in a lovely house. We arrived in time for drinks, dinner and an evening of catching up and sharing laughs. The following morning was cool and sunny so we set out with the dogs and walked along the old Roman wall of Silchester, which is near their home. Often on walks in England, I will think of who travelled along that route before. Was it Jane Austen in Bath imagining bumping into Mr. Darcy? Or perhaps, was it an Edwardian farmer gathering gorse on the moors to feed to her horses? In this instance, I found myself considering the Roman Centurion who protected the homes along these walls. According to English Heritage, Silchester is considered one of the best preserved Roman towns in Britain. Growing up in Ohio, we didn’t have such things, suffice it to say, I’m excited. These ancient ruins were the centre of an Iron Age kingdom from the late 1st century BC where once there would have been a significant town with houses, public buildings and public baths. There is an old Roman amphitheatre, too. The wall we are walking along would have been part of the ancient town’s defences. But now, along parts of the path are hedges bursting with blackberries, sloes, and rosehips. As the day unfolds, Roger and Ian head over to a local farm to see the recently hatched turkey chicks, soon to grow to size for Christmas tables across the region. Meanwhile, Carol and I take to pruning some of the garden. It is a massive garden, and our few hours of cutting back the shrubs and deadheading the roses worked wonders, but maintaining this garden will require several days a week. Sensibly, we call it quits and head to the pub. English pubs remain one of my favourite places. They are filled with people sharing a drink, perhaps a bite of food, and conversation. No loud music or multiple TV screens showing sports. Dogs are welcome. And if the weather suits, sitting outside in a garden nursing a drink. Honestly, it doesn’t get better than this. Before leaving, Carol and I pick beans (we cannot successfully grow them where we are as it is too windy) and then head to the chicken coop to select a cockerel. Roger and I have never had a cockerel as they can sometimes be mean. Besides, hens can organize themselves just fine. But Carol and Ian have three cockerels, and that is too many. We select a Bantam who appears confident and friendly. He’s beautifully coloured with head feathers about the ears making him look like he’s wearing headphones. I’ve named him Tommy. It’s a three-hour drive home, if we don’t hit traffic. Our bags and bounty are packed in the car: beans, berries, sloes and Tommy are all in the car with Sam, Millie and the two of us. We make our way back to Crockern and strategize just exactly how we are going to introduce this small cockerel to our rather large hens. He was fine at Carol and Ian’s, where they have a crazy collection of large hens, Bantams, geese and something that looked to me like a cross between a chicken and a pheasant. We are hoping Tommy respectfully asserts himself in his new setting in Dartmoor. Meanwhile, we can get on with making a crumble, some sloe gin, and putting some beans on the table to go with the rest of our dinner. Now well rested, tomorrow we’ll get back to work. To the back of our garden there is a small hill, an odd bump nestled in the corner of two very high stone walls. The top of the hill spans approximately two square metres and is scaled via a two-metre high steep slope. This little hill is covered in grass, nettles and a few wildflowers and virtually impossible to mow. Also, a small Sycamore tree stands at the top. Happily, each spring, a few Primroses poke through announcing the changing season, but there aren’t enough to declare this mound a gardening success. I can’t believe this hill is a natural occurrence as the ground surrounding it is relatively flat. Jutting out of the ground in the corner, it seems likely it once served as a dumping ground for broken bottles and other rubbish. Or, perhaps it is where a pile of rocks was placed in anticipation of a future project. Nature being what it is, the rocks and bottles have quickly over grown with grass and moss. Whatever its origin, getting rid of this heap of dirt and rocks, with its tangle of tree roots, would require a good amount of digging and there is no certainty as to the gain from such effort. Applying my personal conservation of mass theory, any rock or bucket of dirt I manage to dig, will need to be relocated somewhere else. I currently have no need to fill holes, or build walls, so for now we’ve left it. But the idea of transforming this hill nagged. When, our friend Hilary was visiting, she and I sat on two camping chairs atop of the hill. It was lumpy and rocky, but the view was nice and the tree sheltered us from the sun that day. As we sat sipping cocktails, her boys trimmed a few neighbouring tree branches to enhance our view up the valley. It was at this moment the little hill became more than a hill. It had purpose. It had ‘project’ written all over it. It would become Gin and Tonic Hill! A fine place to repose in comfort – and to drink. You won’t find this location on any OS map. And few will ever know this little mound to be anything so fabulously whimsical. In centuries to come, people will scratch their heads and wonder why on earth this hill was left behind. Archaeologists may stumble upon it and think it perhaps an ancient burial mound. Could my original theory explaining this hill as nothing more than a pile of rocks covered by grass was wrong? Did previous Crockern residents from bygone times perhaps sip their end of the day cocktails here, too? With a distinct goal now to hand, I set about clearing a few large rocks from the top. Attempting to make a rocky hill “level” is a joke. It can’t be easily done with huge lumps of granite stone hidden beneath the surface like icebergs, and tree roots jutting here and there. “Never say never” I told myself and instead opted for “level enough” as my new goal. Roger encouraged my madness by strimming the top every time we mowed the lawn. Last summer, it became a good little place to sit on a blanket and enjoy the view. But a few weeks ago, a similar madness took hold of Roger. I found him outside studying our little hill. About an hour later, he was digging and setting large stones into place. Roger was constructing a fantastic, rocky, seven-steps-leading-up-to-the top-of-our-little-hill staircase. Never one to do anything “good enough” Roger put the finishing touches on the project with a touch of inspiration. He secured a bench. After stepping up the hill, I sit upon my new bench. Roger arrives with G&Ts on offer and joins me. We pause to take in the view across our field toward the river and the valley beyond. The birds are chirping in the tree above. The river is making those relaxing babbling noises that rivers do. We clink our glasses and discuss our ideas for transforming our fields into wildflower meadows. Just over ten years ago, Roger and I tied the knot, performed our nuptials, embraced matrimony. In other words, we married. The tenth wedding anniversary is special, and appears to be celebrated with a gift of tin. Why tin? Tunafish comes in tin. I absolutely do not want to receive, nor give, a can of tuna as a gift. Are we certain it is tin and not gin? But, keeping with tradition — and we are nothing if not adherents of certain traditions — we are embracing this tin thing. We elected to celebrate our anniversary by booking a weekend in Cornwall with the dogs. Cornwall has a rich history of tin mines dating back to the Bronze Age, so it seemed an appropriate choice for our get-away weekend. Explorations of new villages and towns, walks along the coast with the dogs, and some yummy food awaited us. Pack the car and let’s go! Our weekend away was back on track and our generator was functioning as it hadn’t in years. Happy Anniversary to us! And now, a confession: our hard working, thirty-plus-year old Lister lives in conditions which would raise alarm bells in the Geneva Convention for Generators. The tin roof above is rusted and leaks. The entire building needs some TLC as the stone walls need repair and reinforcing. There are no supports for the rusty roof either, so it is a matter of time before the entire thing comes crashing down. Standing within this falling down shed sits a temporary structure which Roger built during our first month of being at Crockern, bravely protecting the generator from the elements and the failing roof above. It works, but it is most certainly not a forever solution. When we arrived to Crockern, the generator was being rained upon and we could have repaired the roof then. But the roof to the house was leaking, we had water running down a wall in what is now our bedroom, the boiler was either on or off, a fuse box lived below a copper water tank, and we had no insulation, so we had other fish to fry. Faced with all this, our emergency, short term fix was Roger’s sturdy, moveable cover for the generator. That was five years ago. When I walk past this outbuilding, I can’t help but think of that famous line from the B-52s “Love Shack” a place where people of all shapes and sizes, stripes and colours head for a groovy good time. It’s Kookie’s Mad Pad filled with multifarious crowds of hipsters. It’s state of mind. But not at Crockern. Our shack is just that, a shack. Home to muck and mess, and a hard working generator. For about a year now, we’ve known we had to address this on-its-last-leg-water-pump. We’ve been waiting as there is a larger project at hand regarding the water system in the house, and when the water tank got its bulge (Can’t remember? See: https://crockernfarm.wordpress.com/2016/12/11/old-stone-cottage-renovation/ ), we had to begin this project. For the most part, the pump worked, but typically on a stormy night, just as we were brushing our teeth before heading to sleep, it would stop and we would have no water, whereby Roger, not I, would head outside into the wind and rain, making his way to the shed where the pump is located, giving it a little tap, tap, tap. Inconvenient, but in the triage of projects, not a high priority. That is until the latest failure and death of the pump. And Roger covered in shower gel and standing outside in his bathrobe. As luck would have it, the plumber arrived within the hour and quickly replaced the pump. As he left, he mentioned that we should consider a new shed for this set up. Did we hear him correctly or was this our tin ear? Another shed? This is not part of the plans for the outbuildings. We hadn’t yet set out and already this anniversary celebration was becoming an embarrassment of riches. Tin roof riches. We will be getting a tin roof for the shed. Not just getting, but installing. As quickly as the plumber left, we loaded the car and headed west to Cornwall where there was no tin in sight. Instead, we settled into the B&B and ordered two glasses filled with gin & tonic. Happy anniversary to us and don’t we know how to just do things in style. Recently, Roger and I find we awake in the morning with a greater number of aches and pains. Feeling this way, one would hope for a slower start to the day, a chance to lounge in bed with a cup of coffee, read the news, and spend an extra hour contemplating the day ahead. Alas, not here at Crockern where everything is a small-demand requiring our attention. Lets begin with Millie. She starts her puppy day with joy and excitement, and no end of energy. Boundless. Bouncing. Filled with fun. Everything is a curiosity and a possible game. She was recently described as “high drive” by a woman who trains dogs for agility. At first, this seemed like a good thing, but what I’ve come to discover is that it may perhaps be code for disobedient. She’s smart and can see the end point, so elects to skip all the middle bits. She’s like the smart kid in geometry class who knows “one does not equal zero” so why bother with all those steps in the geometric proof to demonstrate that fact? At this time of the year, the sky is dark as we set out for this first walk of the day. Still, the birds begin to awaken and there are a few songs to be heard across the moors. After our walk, the dogs and I fill the bird feeders, let out the chickens, and bring in some firewood. As we enter the kitchen, Roger is there with his coffee and catching up on the news. I love the days when I get to be home all day without a work appointment, chore, or social engagement. We all lounge in front of the wood burner, reading and contemplating our next walk. Our house projects have been somewhat stalled of late. No particular reason other than we had a need to take some time off from them. Of course, just as we were settling into that idea, our water tank developed a huge bulge. If it is not obvious, this is not a good thing. A bulge, like any blister on a toe, will eventually burst. And in the house — specifically under the stairs — that would leave us with a nice little mess. And so, despite our desire to take some time off, we were facing a problem. They say, “Every cloud has a silver lining.” What they don’t say is “every hot water tank has …” No, they don’t say that and that is because it would be stupid. Our hot water tank is made of copper, which corrodes over time, especially where the water is more acidic as it is here on Dartmoor. When Crockern was first built, there was no internal plumbing. The river likely played a vital role for all the water needs of residents some time ago. As modern conveniences changed the way people lived, so too the water system at Crockern evolved. Over time, the system here came to resemble something designed by Heath Robinson, one of those ridiculously complicated machines constructed to accomplish something terribly simple. Here’s how it worked: Our water would come from the spring about 100 metres north of the house and enter a tank outside. Water from this tank would be pumped into the house and up into the loft into an overflow tank. This tank permitted gravity to then send water, under pressure, to the taps, showers, and toilets. That same bit of gravity, fed water to the hot water tank which was heated with redirected heat from the Aga. Of course, when we put in the new boiler a few years ago, which had the ability to heat water, but we elected to delay connecting it to the entire house. Nearly a year ago, in one of our exploratory whims, we removed a false wall in the kitchen to reveal all manner of pipes. We lived with these, thinking “one day, we’ll clear all that up and change up the water system.” That day arrived when the hot water tank developed a noticeable rounded swelling on what should have been a smooth surface. We called the plumber and got an estimate. We called another plumber, received a nicer estimate and scheduled him to come out and begin the work. What should have taken one day, unfortunately took two days, but he managed to disconnect the hot water tank and remove it. Next, he hooked up our water system to the boiler which heats the water when we require it, rather than all the time. After he left, Roger removed the redundant overflow tank while balancing on a ladder over the stairs. He also removed all the silly pipes which were hiding behind the false wall and were now no longer needed. The thrilling part is that the pump works less frequently and our water pressure is better. A few weeks later, we back-filled the AGA and as a result are burning less fuel. So why didn’t we do this earlier? We are free of extra pipes and an inefficient way to heat water. We’ve gained closet space. We have greater water pressure. The truth is, there are a lot of projects and this one could wait. The copper water tank was working. And as the Laws of Renovation declare: Each project results in an equal and opposite amount of additional projects which are always unanticipated despite enormous preparation and planning. Repoint the wall that was previously hidden. Build shelves in the closet under the stairs which previously housed the hot water tank. Remember to install a light INSIDE the closet so we can see what is on those new shelves. Purchase a new whizzy pump (the current one sometimes — usually around 11 p.m. at night — stops working and requires one of us (okay, Roger) to head outside and give it a good whack! — and put it under the stairs, along with a ph regulator for the water. Four steps! Four manageable and easy steps. Really? What project can end in four more steps? None. Nadda. Zilch. That wall in the kitchen, which needs to be repointed, is one part of a wall in the kitchen. We still have paint to remove from another wall, and repair blown plaster on two other walls. The beams need to be sanded and shelves under the counter tops to be built. These are a few projects for the kitchen, but not all. With our newly modernized water system, we can permit ourselves to renovate the small bathroom, which still has carpeting on the wall as a nod toward insulation and no insulation in the roof. In the office, there is a radiator I’d like to move, floors to sand, some walls to paint, and another wall to repair. We can’t do any of this until we address the flashing on the chimneys outside. Oh yes, the list goes on and on. Four more steps? In our dreams. There is no more an iconic sight than a herd of ponies grazing together, with stunning Dartmoor landscape as backdrop. So much so, when Dartmoor was designated a National Park in 1951, the image of the pony was selected to be the logo for the park. 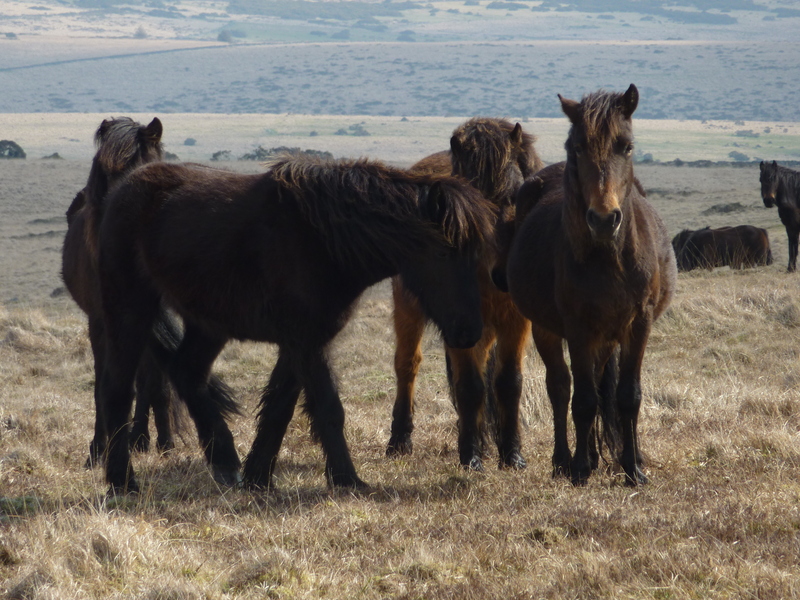 Not only are these ponies an integral part of the moorland landscape, they are part of the area’s heritage having been on Dartmoor for centuries. Hoof prints discovered during an archaeological dig were found to be 3,500 years old. Due to their strength and sure-footedness, the ponies have been used for many purposes over the years: riding and pulling carts, as pit ponies, shepherding, and taking people or goods to market; or, carrying the postman delivering mail or the prison guards as they escorted prisoners at Dartmoor prison. Today, their role is largely environmental conservation through grazing the moor, which helps to maintain a variety of habitats and support wildlife. 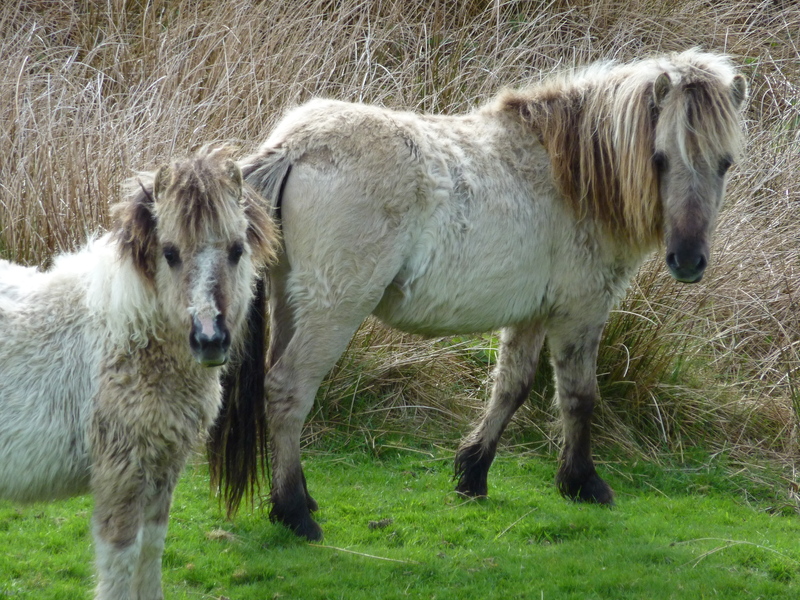 These hardy ponies thrive on Dartmoor despite the harsh weather and poor vegetation. They are smaller than regular horses, and, let’s face it they are fluffy and adorable. It would seem every tourist visitor to Dartmoor would agree and if I had a pound coin for the number of times I’ve had to swerve the car to avoid a tourist stopped on a blind bend as they take a photo of one of these ponies, well I’d be rich. When two ponies laid claim to the fields outside our house, we were thrilled to see them. We would watch them as they ran freely by the river, grazed in the meadow, and came up close to our stone walls to watch us in the garden or say hello to Pie and Polly, the horses which graze in our paddocks. On occasion, they would chase the grazing sheep around them: harmless turf wars. Because of their calm temperament…WAIT! Stop the press and hold your horses! Just the other day our neighbour said she had witnessed one of the ponies taking a lamb and throwing it up in the air the way a cat might play with a mouse it has recently captured. I couldn’t believe it, let alone imagine the scene. The Dartmoor ponies are mellow. They are known for their placid nature. You can walk up to them and they don’t startle. I wouldn’t recommend feeding them (it’s against the law anyway) as they might bite or kick, but they are generally mild mannered. More recently, while working in the garden, a man fishing in the river yelled up to us, “There is a dead sheep in the river.” Roger went to investigate and found a dead ewe mid river with a lot of fresh blood on her face. The cause of death remains unknown, but we couldn’t help but wonder about the ponies. They had been prancing and running near the river just moments before. The fisherman said the sheep hadn’t been in the river when he passed by a few hours earlier. Could one of the ponies have had a hoof in this situation? As possibilities raced through our minds, the immediate concern was the now-motherless-baying lamb nearby, the one which Roger saw being born in the fields not more than a week before. After a phone call, the local farmer came and gathered the dead ewe and took the lamb back to bottle feed it. It was a sad moment, but a part of the nature of things. Sheep die, lambs become orphans. You hope you discover them in time to avoid their deaths too. So, imagine our surprise when Roger saw one of the ponies prancing and bucking along the same stretch of river. Quickly, out came the binoculars! Clearly this pony, one of the pair we had been lovingly watching for weeks, was harassing another sheep. As we headed out to address the situation, people walking past stopped us to let us know what they were witnessing. In an instant, Roger ran across the garden, sprang over the fence and raced toward the ponies in hopes of stopping the brutality. Our neighbour who was visiting quickly followed to help and I grabbed the phone to call the farmer. Something crazy was going on! When I arrived on the scene, the horses were gone and a single, very stressed sheep was in the river panting. The three of us surrounded the sheep and as it darted, our neighbour swiftly grabbed her. We held her still, calmed her, and noticed a huge gash along her rear leg. The farmer arrived a few minutes later and he took her back to his farm to tend to her wounds. We’ve asked a number of people about this behaviour and no one has witnessed anything like it. Since these events, someone, likely from the Dartmoor Hill Pony Association, an animal conservation group, has come along and moved the ponies higher up onto the moors. Perhaps the two needed more of their herd to keep them from terrorizing sheep. I’ll miss seeing these two ponies outside, and while I don’t like to see the sheep chased, I didn’t mind how effective the ponies were at keeping the sheep from jumping our walls and getting into our paddocks. With our de facto sentries gone, we really now do need to finish repairing that bit of wall.